The process of applying this service pack to your BV Commerce 2018 website is nearly identical to past release upgrades. If you need to upgrade from an older version or would like to create a fresh installation please refer to the respective documentation. The "BV Commerce 2018.1.1.2250 SP1" download is intended for fresh installs or for upgrading from BVC 2017 or older (refer to the links above). The "BV Commerce 2018 - SP1 upgrade" download is intended for websites that are running BVC 2018 and contains only the files that were modified between 2018 and 2018 SP1. While you could use either download to apply the service pack, the upgrade download should save time since it only contains the changed files. These installation steps assume that you already have a functioning BV Commerce 2018 website. Note: if your website has any custom code outside of your theme folder (\www\BVModules\Themes\YOUR_THEME_FOLDER) you may need to use a file comparison tool like Beyond Compare to merge your changes. Create a backup of your website files and database. 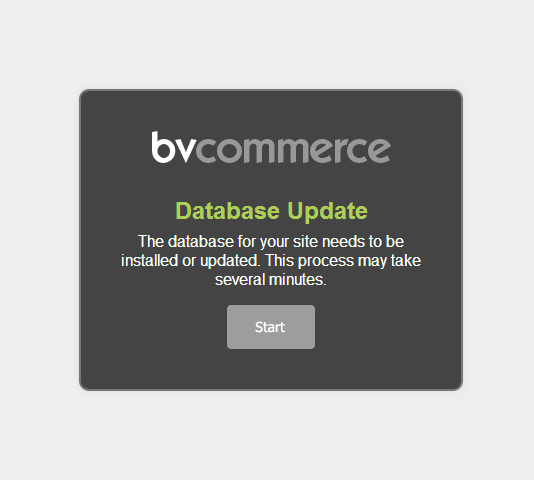 Download "BV Commerce 2018 - SP1 upgrade" from the Downloads page of your account. Unzip the file on your computer to a location of your choosing. Copy only the contents of the \www folder to the server; the other folders contain the source code for developer use. Open your web browser and go to the address of your BV Commerce store. Provided that the above steps were done correctly you should be redirected to the /SQLPatch.aspx page and see the installation screen below. If you don't, please re-check the steps above. Click the "Start" button to complete the upgrade. This can take a few minutes. Once the upgrade is complete you will be redirected to the store homepage. If your site uses a theme that was created from the "Bootstrap3 Responsive" or "Foundation4 Responsive" themes in BVC 2018 please read the additional instructions below. Congratulations! You've successfully upgraded to BV Commerce 2018 SP1. This service pack contains a number of changes to the Bootstrap3 and Foundation4 Responsive themes. If you created a theme derived from these themes (i.e. you started by duplicating the Boostrap3 or Foundation4 Responsive theme and then modifying it) you will need to compare the updated Bootstrap3 or Foundation4 Responsive theme files to your theme and merge the differences. This is where a file comparison tool like Beyond Compare is indispensable as it will allow you to easily compare the theme folders and locate the differences in each file.